You’ve probably seen a photo or video of Iditarod sled dogs pulling a musher across the frozen tundra or through a snow-capped forest. Or maybe you’ve been lucky enough to see them in the flesh…er…the fur. What you may not know is that each sled-dog pair plays a different role in navigating the sometimes difficult trails and challenging terrain faced by racing teams. 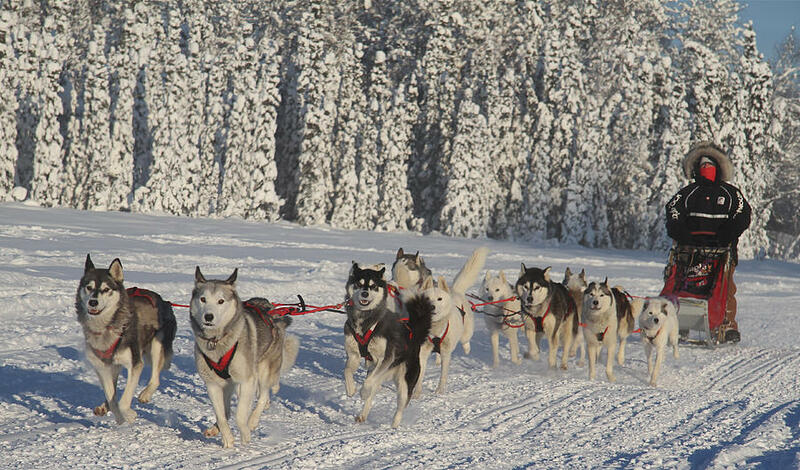 The dogs are positioned in pairs on either side of a gangline, or towline, that attaches to their harnesses and to the sled. Iditarod rules state that a musher may start a race with a maximum of 16 dogs and a minimum of 12 dogs on the gangline. At least six dogs must be on the line at the finish of the race. Most Iditarod mushers will start the race with the maximum. More dogs = more pulling power. Lead dogs: Perhaps the most critical part of the team, lead dogs set the pace and keep the other dogs on the trail. They are the dogs that respond to the musher’s commands of “gee” (right turn) and “haw” (left turn). Lead dogs must be alert and intelligent so they can find and follow the trail when it is covered over with snow. They do so through smell, sensing where other teams have passed, and feel, by feeling with their feet the packed trail beneath the loose snow covering. They also keep the other dogs in the team moving by pulling the gangline taut. In the past, some Iditarod mushers used only one lead dog. Today, it is more common to see two. Swing (or point) dogs: Positioned directly behind the lead dogs, the swing dogs help steer the team around corners. As lead dogs make a turn, it is not uncommon for the other dogs to want to jump off the trail to follow them. The swing dogs pull the team in an arc that keeps the other dogs on the trail and brings the sled and musher safely around a corner. Team dogs: These are the team’s brawn. They pull the sled and maintain speed. On average, Iditarod sled dogs pull 300 to 500 pounds (including sled, supplies, and musher). There are several pairs of team dogs, depending on the size of the sled-dog team. Wheel dogs: These are the two dogs closest to the sled. They are usually the largest of the dogs because they are the first to take on the weight of the load being pulled, especially during starts and climbs. Wheel dogs should be even-tempered as they must withstand the constant slamming of the sled runners behind them. 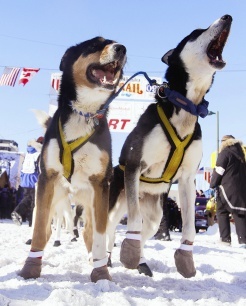 It is not uncommon for mushers to switch their dogs’ positions during a race. Some dogs make better leaders in certain weather conditions but not others. Sometimes, after a long run, a musher may wish to give a lead dog a break. Dogs who are fighting may need to be split up, or a female in heat may need to be moved away from the males. Sometimes during a race, after a few dogs have been dropped and a team becomes smaller, a single lead dog may be used instead of two. During a race, you will often see the dogs wearing colorful booties on their feet. These booties protect the dogs’ feet from the abrasive snow or ice that can damage paw pads or get between toes and cause discomfort during a long-distance race. Booties are generally made of sturdy materials such as polar fleece, nylon, or canvas. Two pieces are sewn together to form a pocket that slips over the dog’s foot and are held in place by Velcro or electrical tape. Iditarod rules stipulate that a musher have at least eight pairs of booties for each dog at all times, although dogs will usually go through a lot more than this over the course of a race. 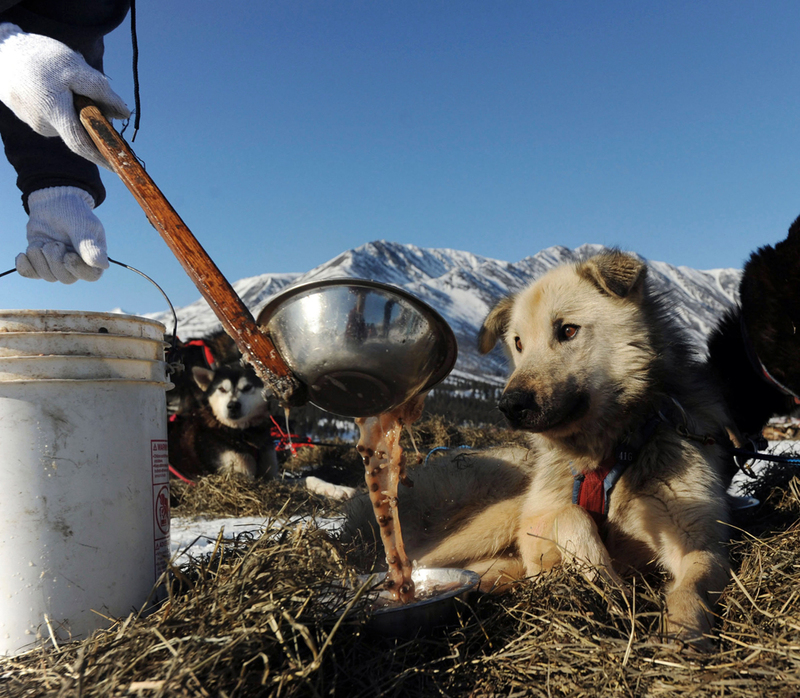 The average Iditarod sled dog burns 12,000 calories a day on the trail, so dogs must be regularly fed and given frequent snacks at checkpoints. Food is the fuel that keeps the dogs’ engines going. Before the race, mushers arrange to have bags of dog food shipped to the various checkpoints along the trail. Each musher comes up with his or her own special formula, relying heavily on high-protein fats, oils, and other nutrients. Chopped up red meat, fish, and beaver are often used. Native mushers sometimes use seal blubber. The meats are usually mixed with a commercial dry dog food and water, or other liquid, then heated in a cooker into a kind of gruel. The liquid keeps the dogs hydrated (it is impractical to give dogs plain water in freezing temperatures, and most huskies won’t drink water in winter anyway). Snacks generally consist of individual pieces of frozen meat, such as whitefish.